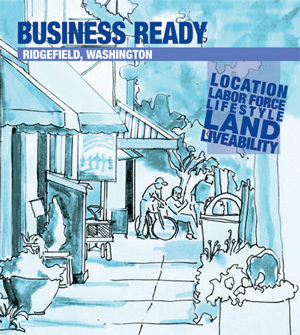 Business FAQ - The City of Ridgefield, Washington | Forward Thinking. Rooted in Tradition. How can I determine the zoning and development regulations for my property? How can I get answers to a planning related question? After you’ve checked the County GIS and the Development Code regulations, the Planning Division is happy to help answer any questions. Please fill out our Online Planning Inquiry Form, and we will connect you with the staff person best able to help answer your inquiry. I hear there is a new development project pending near me. How can I get more information? Pending development projects are summarized in our monthly Community Development reports. All property owners within 300 feet of a proposed project will receive a notice from the City. You may also find notices online or by reading the legal notices section of The Reflector, the city’s newspaper of record. How can I comment on a proposed development project? Depending on the type of projects, you can provide written comments or testify orally at a public hearing within the prescribed comment period. Staff will consider all public comments received, and comments that speak directly to the project approval criteria are the best way to influence the final decision. Please contact us for more information about the comment period and approval criteria for a specific project. How much are land use permit fees? Fees vary based on the type of permit and are detailed in the Master Fee Schedule. All permit fees must be paid at the time of application submittal. The City uses a cost-recovery structure for some types of permits, which means that the initial fee is due at the time of the application and additional staff time required for review is billed to the applicant on a monthly basis. How can I obtain copies of the land use permit applications? Land use permit applications are available online and in person at City Hall. All applications require the Master Land Use Application and supporting applications specific to the review requested, such as subdivision or site plan. Please contact us or file a Planning Inquiry to determine which applications are required for your project. How can I submit my land use application? Can I submit online? Land use applications must be submitted by mail to City of Ridgefield PO Box 608, Ridgefield, WA 98642, or in person, deliverable to Ridgefield City Hall at 230 Pioneer St and is open 8:00 a.m. to 5:00 p.m. Unfortunately, we cannot accept applications submitted electronically. What is the difference between Type I, Type, II, and Type III land use reviews? Generally, the higher the number, the greater the level of discretion and associated scrutiny involved in the decision-making process. A Type 1 process involves staff review of relatively straight-forward land use regulations, such as numerical standards like building height. A Type II process is also a staff review but involves some discretion to interpret the applicable regulations, such as whether a proposed downtown facade meets the district’s design standards. A Type III process requires considerable discretion to determine whether a proposed development meets the approval criteria, such as minimizing impacts to neighboring users, and is decided by a Hearing Examiner. How long does it take to get a land use permit approved? It depends on the type of application. Generally, Type I applications can be reviewed in 2-4 weeks and Type II applications can be reviewed in 6-8 weeks, though review times vary depending on the thoroughness of the application and the Community Development Department’s workload. Type III reviews, by law, cannot exceed 120 days; staff aims to complete their review in less time, but these are typically complex cases to each review process differs. How can I get involved in Planning Commission? You are welcome to attend Planning Commission meetings, held the first Wednesday of every month, and participate in public hearings. If you are interested in serving on Planning Commission, please complete an application and submit to City Hall. We will put you in touch with the Chair of the Planning Commission to discuss future opportunities. What building regulations apply to projects in Ridgefield? Effective July 1, 2013, the 2012 Building Code version will be applied to all projects. Do I need a permit for a small project for my house like a deck or a fence? You may. Fences for a single-family house are exempt from permitting, but a Fence Permit is needed for all other fences. Decks or platforms with no roof or cover that are not over 30 inches above finish grade are exempt from building permits, but other decks are required to obtain a building permit. You may. A Tree Cutting Permit is required to remove a tree in the public right-of-way, such as trees in the planter strip. No permit is needed for trees located on private property. What types of public nuisances can the City regulate? The City regulates public nuisances such as tall grass, noxious weeds, fire hazards, accumulation of junk or debris, decaying structures, and vermin. The City also regulates violations of the zoning code, the building code health and welfare regulations, and sidewalk repair standards. Read more about code compliance. How can I file a complaint with the City about a public nuisance? Please complete the Comment/Complaint Form and return to our department by mail, email, or in person. Our code enforcement procedures are complaint-driven. When we receive a complaint from a citizen about a possible violation, we investigate the situation and issue a notice if a violation is present. Our code enforcement staff does not patrol the community on a regular basis because of staff time constraints. If you believe there are additional violations that should be corrected, please file a complaint with the City and we will investigate. I received a notice from the City to correct a violation but I disagree about the specifics. How can I work out a solution? Call the City to discuss your concerns at (360) 887-3557. If you believe the notice was issued in error or that you are not in violation of the regulations, you may appeal the determination. If you are unsure how to correct the problem, please contact us and we will help connect you with the right information and resources. Our primary goal with code enforcement is to correct the violation rather that punish the violator.